Four city blocks downtown near the historic Tampa Theatre will be decorated with hundreds of daybeds and plush couches & will be transformed into a South Beach-style outdoor lounges. Tampa’s Chillounge Night will have an array entertainment, dancing, fine foods and drinks along with a fashion show, opera performances, and Cleopatra parade on beds, cigar lounge, a Brazilian Samba parade and much more! Tampa’s Chillounge Night will be held from 6pm till 11pm - Admission is $20 at the gate, $15 in advance and limited VIP tickets $75. (All VIP tickets include: food, gift bag, cigar and drinks in the special VIP Lounge area). So come get your chic on for an enchanted evening to mix & mingle or check out the captivating sights and simply chill … but you must be 21 years old to enter and enjoy this event! This evening of entertainment will also benefit the community and a local charity - The Friends of the Festival in honor of TIGLFF’s 20th anniversary. Keep coming back for more information about this and other Tampa Bay area events and other great things to do in Tampa Bay! 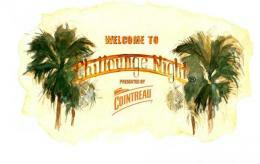 The Chillounge Night party is the brainstorm of Floridian gallery owner Rainer Scheer, for more information on Chillounge events click here .